How do you land your dream project? By writing the best bid! Over the next few weeks we'll show you how to write the perfect bid. 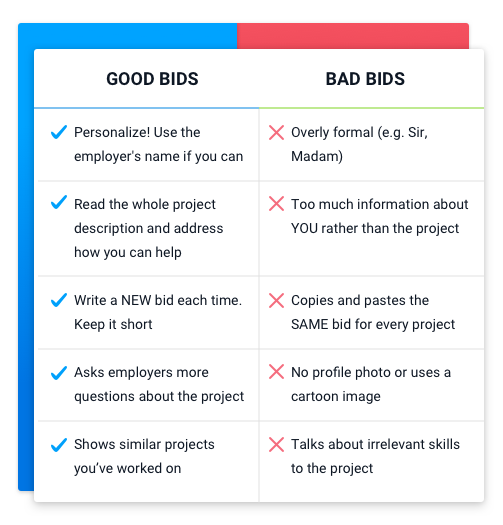 But first, what is the difference between a good and a bad bid? Can you tell which one is the good bid? Meanwhile, the one on the right is obviously a generic copy and paste bid that they are sending to all projects. Nothing specific about the project is mentioned in the bid. We understand that it's not always easy to write the best bid, because some projects are also low quality. We're working hard to improve both the quality of projects and bids on Freelancer.com. Freelancers who write better quality bids are significantly more likely to win projects, and earn money. To get an indication of your bid quality, you can see your Bid Quality Score when you are bidding on projects. Got any questions regarding bids? Feel free to comment them below! Good luck and stay tuned for more next week!